This is my shadow. Some weeks ago, he was more or less the only company I had. 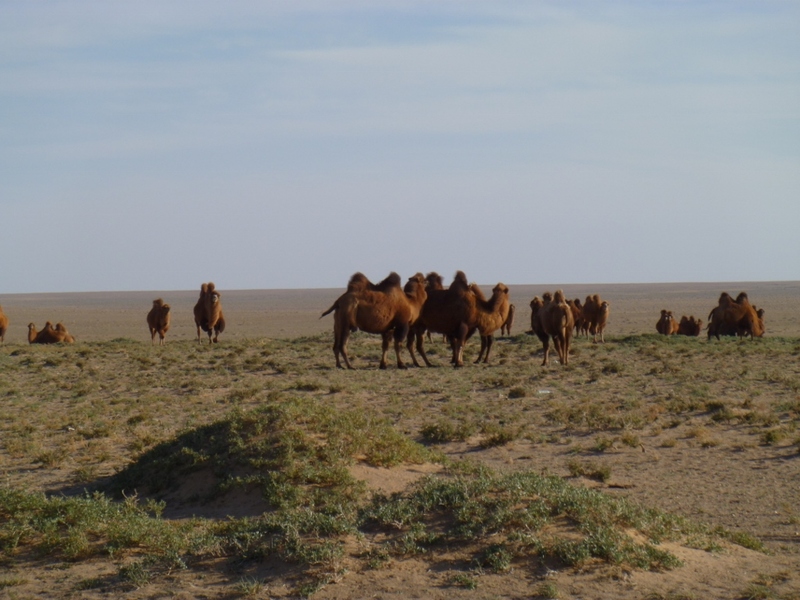 Together we crossed the Gobi Desert. We sang songs, and had great chats and laughs. 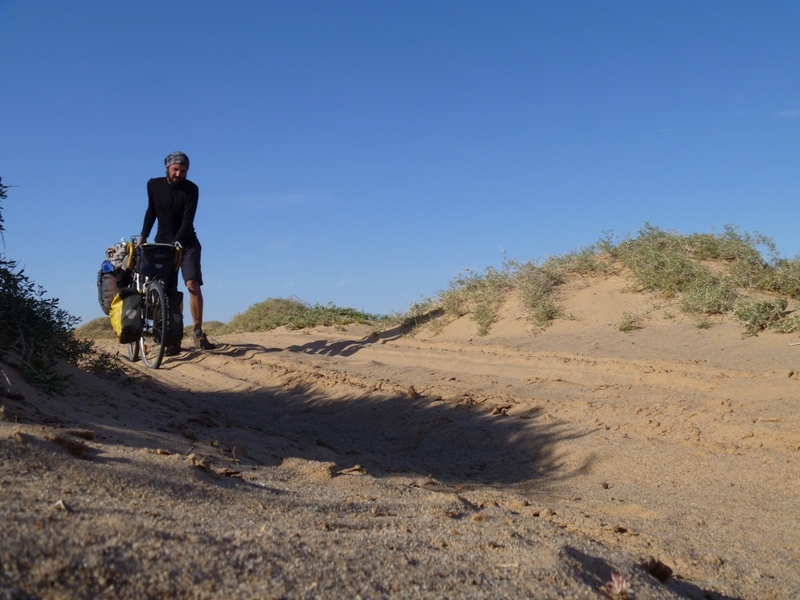 The real adventure started in Saju Sand, a province capital 400 km southeast of Ulan Bator. Until there, the road was paved with the smoothest asphalt I’d ever seen. Strange for Mongolia, but I didn’t complain. The only problem with such good road conditions is that it gives you the feeling there is civilization everywhere. Indeed, there’s a shop around every corner. If only there were any corners. Mislead by this, I had survived the last 200 kilometers on half a bread and a pot of Bisella, the poor man’s Nutella. I left the main road to find some provisions. It had been a big cycling day, so I pitched my tent near town, and slept till noon. Next day, to avoid backtracking, I searched for the main road guided by my compass. Not much later I reached the asphalt and started battling the strong headwind. My mind had made a strong ‘asphalt-mainroad-connection’ and ignored all the indications that told me otherwise. Different milestones, a slightly wrong direction. But look at the asphalt, it had to be the road to China, right? I asked some people. Some said yes, others no, but most of then probably didn’t understand me. Or they didn’t know, and were too proud to admit that. But of course I believed the ones that said yes. It took me 5 hours to reach the end of the asphalt, forty kilometers further. 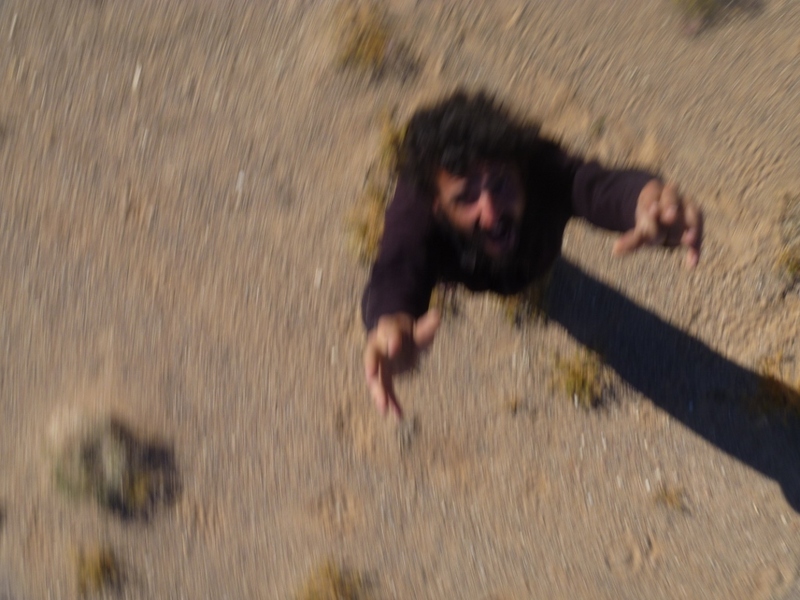 There, some construction workers stopped me and told me I had to go back to Saju Sand to reach the border. No way. It couldn’t be that big of a detour. I had been going more or less the right direction. Fortunately, after hanging around for a while, I met an old man who spoke Russian. After a short chat, he whispered in my ear that there also was the old road to Zamin Ude, the border town. He guided me to a small dirt track, with a rusty signpost that confirmed this fact. 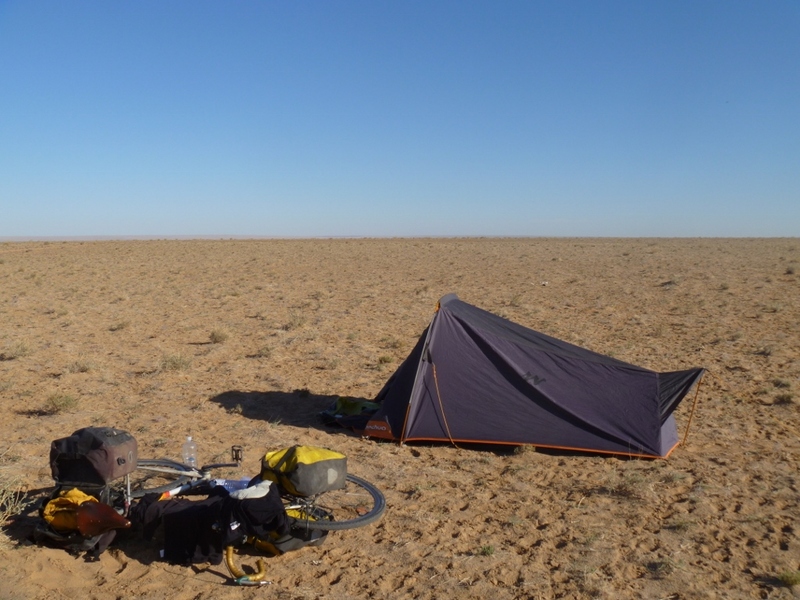 Until that point I wasn’t really satisfied with the cycling I’d done in Mongolia. The road from Russia to UB is completely paved, and not very exciting. 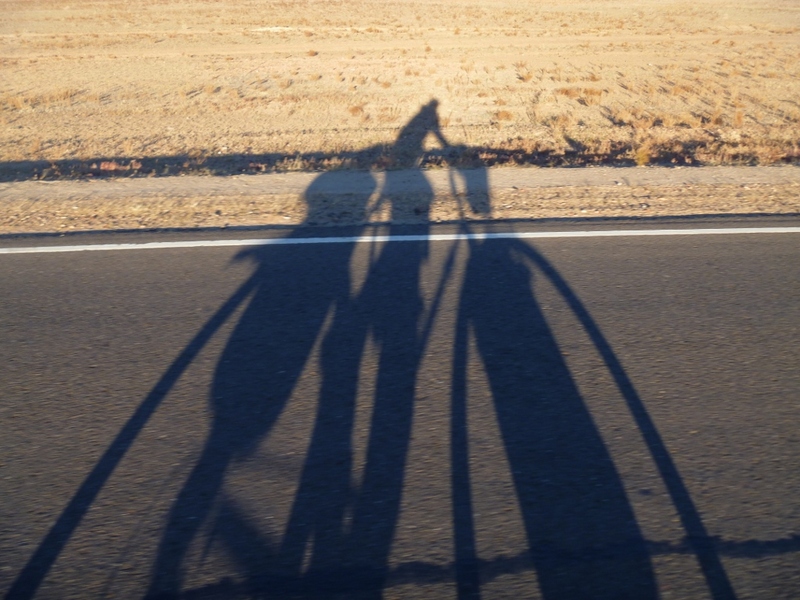 I’d heard tales of fellow cyclists, about navigating by compass through the steppe, hauling bicycles through chest-deep streams, etc… These stories made me feel like a middle aged man, riding the ‘Mosel-radweg’ on an e-bike. The moon was shining bright, and I really felt ready for a night ride through the desert. Now it was my time for adventure. I’d left the banks of the Mosel. Besides, what could go wrong? I was prepared this time. A whole bread, 3 sausages, a tomato, and a stomach full of Tsuivan, a Mongolian noodle stew. And of course, two liters of water. I started following the trail, which was going straight south instead of southeast. But in the worst case, I would bump upon some modern day Chinese wall, they probably have built to prevent a possible Mongolian invasion. There I’d have to go left, and follow the fence to the border town. It was as simple as that. No way I could be lost. Three hours later I called it a day and camped. Next morning, I noticed that I’d almost gone through my water supply. The track I’d been following, didn’t look as much like a road as the night before. But there was good new too, not much further I saw a ger, so I walked there. The nomads topped up my water bottles, and gave me some dried yogurt. They also assured me I was on the right road. I just had to turn left…. somewhere. Life was good again! There was only one new problem. My visa would expire the next day, and I had to cover about 200 kilometers more. Hard but not impossible. At sunset, I’d done a forty, mostly pushing my bike through the loose sand. I was too tired for a night ride, so all I could do I hope for a car next day. To prevent running out of food, I’d gathered all the wood I’d seen during the day, to be able to cook some strayed items in my panniers. It became a noodles and salsa feast. Day 3. The car didn’t show up. At least, not in the right direction. I stopped a van, to ask if I was on the right road. I was. So the random left I’d taken the day before seemed to be the right one. I showed them my passport, to explain the problem. They started laughing. I’d misread the date, and was already 4 days overtime. This released all the stress. The harm had been done. The consequences would follow, but there was nothing I could do about it anymore. No more time pressure. The only problem now was the food stock. I could squeeze a modest dinner out of my bags, but then it was over. I was ready for another night ride, but soon I bumped into a big crossing road, where I had no of clue where to go. I’d figure it out next morning. That night the wind got very strong and my tent got blown away. I didn’t sleep for a minute. Waiting for a car was no option so I picked the road that offered me the best tailwind I’d ever had. A bit later a car passed by. The driver told me it was still much further than I thought, and offered me a ride. I swallowed my pride an boarded the car. Once in town, I went straight to the internet café to find out what the consequences of overstaying my visa could be. I didn’t get specific numbers, but different sources mentioned high fines. By reading the history of Genghis Khan, I’d learned that Mongolian Punishment is something one should avoid. All the dates on the visa extension where written with a pen, and the officers sloppy handwriting allowed me to change some numbers. I though the chances that I was in some electronic system where rather small, so this would be a gamble with positive expectations. The border guard wasn’t a stereotype. No severe looking man, but a smiling young woman. I high-fived my shadow and handed my passport. After a quick glimpse, she grabbed the stamp, and lifted it. The next minute became one of the longest ones in my life. My heart was hammering its way outside my chest. Something stopped her. She had a closer look, slowly grabbed a telephone and I knew it was over. I got guided to some small office in the back, where they explained me I had to pay a fine. Communication was hard, so I played stupid, and quickly agreed to pay. This could have ended much worse. At least I was in China. That’s cool life dude. I wonder how you coped with in mongolia desert..
Wow, i love reading your blog.. I’ve check your last post was 5 years ago.. hope you are all well.. whats your latest Adventure update?